Did you know that popover batter and crepe batter are essentially the same? So how do we get a high, crusty, puffy popover with a hollow center, instead of, as Al Sicherman put it, a crepe that is "desperately flat"? You need three things: good gluten formation, high heat, and a narrow, high container. The container forms the steam released in the oven heat into one giant bubble. This steam is contained with gluten from flour proteins, starch, and protein from eggs. So the popover literally 'pops' with steam, but the steam doesn't escape because the stretchy protein holds it inside the batter. Flour provides the structure for the product. The gluten, or protein, in flour, combines to form a web that traps air bubbles and sets in the heat of the oven. Starch in flour sets as it heats to add to and support the structure. In popovers, we want a lot of gluten formation, which forms a web to hold the steam in baking. Don't use cake flour or low protein flour for popovers, since they won't hold around the large steam bubble, and you'll end up with a heavy muffin. Flours like White Lily and other brands, particularly those sold in the south, don't have enough protein to hold the air as the structure expands. If this is your first time making popovers, or you haven't had success in the past, try using half bread flour and half all-purpose flour. And measure the flour correctly! There isn't a lot of fat in popover batters. Fat helps make the dough crisp, assists in browning, and adds flavor, especially if you use butter. Some popover recipes call for baking powder; others do not. We prefer those that do not use baking powder, because we think the flavor is better. Eggs provide the steam that makes a popover pop, and provide structure in the form of more protein. The yolks also act as an emulsifier for a smooth and even texture in the finished product. The eggs also add flavor to the popover. And they help provide a nice brown color to the finished popover, and a crisp crust. Liquid combines with two proteins in flour, called glutenin and gliadin. Don't worry about these names - you don't need to remember them! Those proteins combine to form gluten. There is a lot of liquid in popover batter to provide steam and to make a firm web of gluten that contains the steam during baking. The batter has to be liquid enough so it can expand quickly in the hot oven, yet have enough protein and starch to set up as the liquid evaporates as steam. You can use special popover pans, which are nonstick cups held together with rods. There's a large space between each cup so the heat can move freely around the popovers, creating steam, then setting the structure. You can also use custard cups, well greased, and set them 3-4" apart on a baking sheet. Some recipes call for preheating the pans or cups. We don't feel this is necessary, but you can certainly preheat the pans in a hot oven if you want to! We prefer putting popovers into a hot oven (450 F) for 10 minutes or so to get maximum steam production, then reducing the heat to 350 F so the popover structure sets and holds. Some recipes call for putting popovers into a cold oven and then turning on the heat. 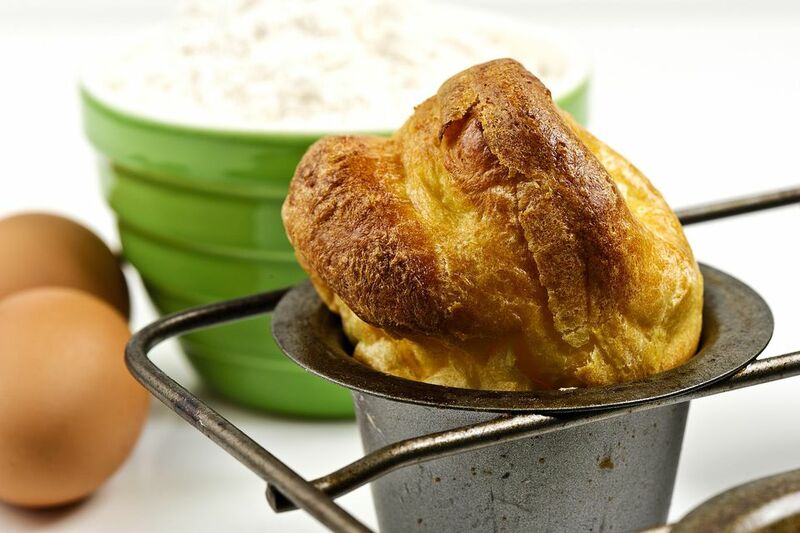 We think this method runs the risk of burning the popover bottoms, and we've found the popovers don't rise as high. Make sure that your oven temperature is accurate. When the baking temperature and time are as critical as they are in this type of recipe, an accurate oven temperature is essential. Use an oven thermometer for best results. So follow the science behind popovers, and yours will always rise to great heights and be crisp and tender at the same time.